This introductory course for health and fitness professionals will teach professionals how to identify muscle imbalances and correct postural deviations following cancer surgery and treatment, how to identify and correct range of motion limitations following cancer surgery and treatment, how to prevent, identify, and manage lymphedema, and how to prescribe a comprehensive, individualized recovery program that will improve a patients’ quality of life and minimize the risk of comorbidities. By 2030 there will be over 20 million cancer survivors in the US and almost 200,000 newly diagnosed every year. Surgery, including amputations, and treatment will leave patients with muscle imbalances and range of motion limitations and out them at risk for heart and lung damage, osteoporosis, and diabetes: all can be prevented and/or managed with exercise. Andrea Leonard is a 33-year cancer survivor and President/Founder of the Cancer Exercise Training Institute. She graduated from the University of MD in 1990 and went on to get certified as a Corrective Exercise Specialist and Performance Enhancement Specialist by The National Academy of Sports Medicine (NASM). She has been certified as a personal trainer by The American College of Sports Medicine (ACSM), the National Academy of Sports Medicine (NASM), the American Council on Exercise (ACE), and as a Special Populations Expert by The Cooper Institute. She is also a continuing education provider for NSCA, NASM, ACE, ISSA, and AFAA. Andrea is part of the Hedstrom Fitness/BOSU® Development team and the Chairperson for the Medical Fitness Network Advisory Board. Andrea has published thirteen books on the topic of cancer and exercise and has authored countless articles on this subject matter. Andrea has personally trained over 7,000 health and fitness professionals in 17 countries. 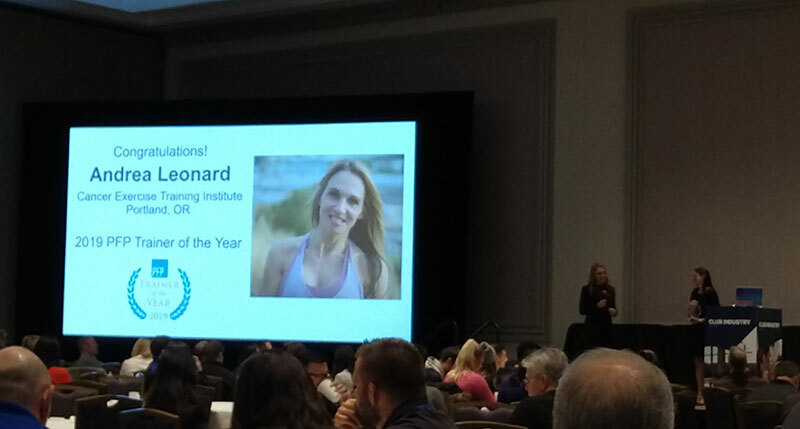 Course author Andrea Leonard is presented with the 2019 PFP Trainer of the Year Award at Club Industry 2018.